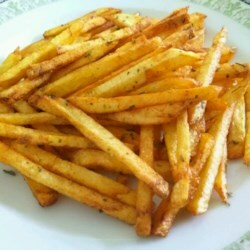 This is the way to make homemade fries as in a restaurant. It's in the sugar, guys! However... if you want them a bit crispier, here's a trick: first blanch the fries in hot oil for 2 min. Remove, let cool. Return and fry till golden brown.